About half of the marbles from the Parthenon were transported to Britain by the 7th Earl of Elgin and ended up in the British Museum. 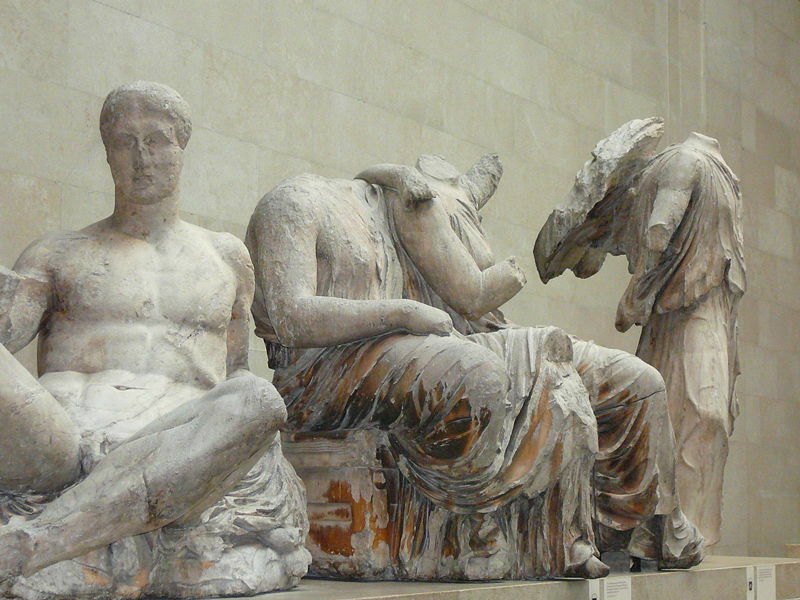 The rest of them are scattered around the world in museums and galleries, but the Elgin Marbles are the biggest single collection of these incredible public works. They have been controversial from day one, from Elgin’s time to the present when their return has been demanded by a number of people. The British Museum has not been cooperative and it is unlikely it will ever be. As you can hopefully see from the detail of the frieze above, everything was perfect. The stolen friezes go around the rooms, and they are no small rooms, and every single fold of canvas has been done with a meticulousness that seems miraculous even after the paint has been stripped away, after time and the winds have done their damage and they have been shipped to the other side of Europe. They have even been blown up and yet their former glory is more than apparent. Clothing on the pediment sculptures is even more fantastic. However, they have obviously suffered horribly and seem more like handsome corpses than decayed masterpieces. At first, it seems ridiculous to think that the dresses of these figures are made of rock, but they are and they also have been blown up and, furthermore, lounged through the horrible damage done to the pieces by Elgin’s expedition as they sawed one of the greatest buildings ever erected into little bits. Sometimes the work reminded me of the Louvre’s Nike and the decay of that piece and many of the Elgin marbles do make their ragged yellow dresses and severed body parts act as a terrible reminder of what has been lost forever. There was an interesting video in one of these rooms in which a virtual restoration of one of the scenes was done, one of the metope sculptures if I remember correctly, but even this made it clear that it is impossible to know what exactly these scenes were like. For instance, what was the background color of this battle? What were the centaur’s colors and had these two perhaps even clothes or jewelry? They probably had weapons made of some metal, perhaps even golden ones. There are many things beyond our knowledge, so it is no surprise that often the most we can do is sit in the ruins of past glory in silence.